Have you ever taken a walk on the beach in the fog or been driving as fog rolls in? Fog is captivating but it obstructs our view of the whole picture. It is not until the light of the sun cuts through that the fog that it dissipates and enables us to appreciate the view ahead and navigate our journey with ease. Saturday morning our second grade CCD students received the Sacrament of Penance for the first time. Their faces radiated the love that God has promised us in this sacrament! They understood that their sins build up and block, like fog, the view of their best friend, Jesus Christ. They understood that Jesus Christ, the Good Shepard, rejoices more over one sinner who repents than over the 99 who have no need of repentance. The Sacrament of Penance is God’s gift of grace to us that breaks through our sinfulness so that we are able to return to life of grace. In the story of the Prodigal Son, Jesus tell us the story, of the father waiting out by the road longing for his wayward son to return. And when the son returns and begins to give his repentance to his father, the father interrupts him and shouts orders to begin the celebration. Jesus is telling us that this is how God feels about our reconciliation. It isn’t about being judged or scolded. It is all about letting ourselves receive His Son, the merciful and healing sanctifying love and peace that only God’s love can give us. Our sins obstruct our relationship with God and it is not until we humbly confess our sins, and make sacramentally present Jesus’ call to conversion, that the healing light of grace helps us return on our journey of life with a clear view. The purpose of this sacrament is to restore our friendship with Jesus Christ and the primary effect of the sacrament is a renewal of life in the Spirit. 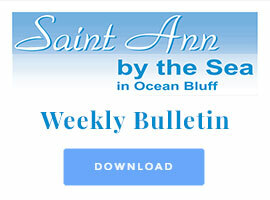 St. Ann by the Sea Parish offers the Sacrament of Confession on Saturdays at 3pm in the Chapel and by appointment at 781-834-4953.